owners from Pam Johnson-Bennett's practice! Meet Mambo, the cat who attacks her owner, but only on Sunday, and Bonsai, the cat whose dislike for the new boyfriend proves very embarrassing. What secret does Freddie know about his owner's new wife? Is a dead body really buried under the home of the Foxworths? And Why is Ralphie climbing the walls - literally? In this offbeat and illuminating book, Feline Behaviorist Pam Johnson-Bennett takes you on the wildest and most unusual house calls of her career. As entertaining as they are instructive, these stories - each of which unfolds like a mystery - will help owners better understand the ever fascinating cat psyche. Following up on the success of her award-winning best seller, Think Like A Cat, Pam Johnson-Bennett sheds light on the communication breakdown between cats and humans. "Doggone it, I'm supposed to be an expert myself - and as always, I've learned from Pam Johnson-Bennett. She's the queen of cat behavior!" Pam Johnson-Bennett is a Certified Animal Behavior Consultant and clinical member of the International Association of Animal Behavior Consultants. She is the author of a number of award-winning and critically acclaimed books and one of the country's most well-known and popular experts on cat behavior. Her latest book, Cat vs. Cat: Keeping Peace When You Have More Than One Cat, addresses the unique challenges of maintaining a peaceful multi-cat home. This first-of-its-kind manual addresses the often frustrating circumstances multi-cat owners face. Cat vs. Cat provides owners with valuable insight into how cats communicate both with humans and with other cats. It uncovers the true motivation behind behaviors so owners can better understand what cats need from us, their environment and each other. Pam's previous book, Think Like a Cat: How To Raise A Well-Adjusted Cat - Not A Sour Puss, is a best-selling comprehensive survival guide for all aspects of cat care and training. The book received a special award from the Cat Writers' Association. The innovative methods described are based on Pam's unique way of helping owners look at behavior from the cat's point of view. Her cat's eye-view approach has been the subject of many feature profiles and has put her at the top of her profession. This ground-breaking book focuses on building a good relationship between cat and owner and avoiding behavior problems through communication. 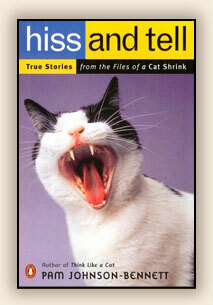 Some of Pam's other books include Hiss and Tell: True Stories From The Files Of A Cat Shrink, which provides a hilarious peek inside the world of one of this country's most popular pet experts as she takes you along on her unusual house calls. You get to play detective as the individual mysteries unravel. Psycho Kitty: Understanding Your Cat's "Crazy" Behavior, which won the Cat Writers' Association Award for Best Behavior/Training book, describes behavior problems through entertaining real-life examples and provides a treatment plan for each case. Twisted Whiskers: Solving Your Cat's Behavior Problems received the Cat Fancy Editor's Choice Award and is considered a classic on cat training. In addition to running a private veterinarian-referral behavior service, Pam is the spokesperson for Friskies and is in her second year on the national tour with the Friskies Cat Team. The tour is designed to educate cat owners on feline enrichment and creating a more stimulating environment. In 2004, in addition to touring with the Friskies Cat Team, Pam was the spokesperson for the Friskies Shelter Program that awarded a total of $100,000 to ten in-need shelters across the country to create ultimate cat habitats. Pam and country artist Leann Rimes unveiled the prototype habitat to the media appearances including Fox News Channel, CNN and National Geographic, as well as being a popular guest on many nationally syndicated radio programs. She is a frequent speaker at veterinary conferences and humane organizations around the country and has taught numerous seminars on behavior for the general public and veterinary personnel. In 2003, Pam was a member of the Friskies Dream Team which included designer Frank Bielec from Trading Spaces and Lou Manfredini (America's Mr. Fix-it) from The Today Show. Together, they designed the Ultimate Cat Habitat that was unveiled to national media at the Atlanta Home Show. In 2005, Pam ended a five-year run as the resident cat behavior expert at the popular women's network, ivillage. Previously, she was also the award-winning behavior columnist for Cats magazine as well as for the internet magazine, The Daily Cat. Pam also was involved in the veterinarian and public educational launch of Feliway (a behavior modification product), in which she wrote an instructional article for veterinarians and toured as a spokesperson. She was also the national media spokesperson for Procter & Gamble's Febreze, to help owners learn about controlling pet odors. Pam makes numerous national media appearances including Fox News Channel, CNN and National Geographic, as well as being a popular guest on many nationally syndicated radio programs. She is a frequent speaker at veterinary conferences and humane organizations around the country and has taught numerous seminars on behavior for the general public and veterinary personnel.